← Can you Kindle it? Reviewing a film that has just received the highest cinematic accolade is challenging. Then again, those good folks at the Oscars don’t always get it right, and often reward dreary, self-important “Oscar-bait” that we mere popcorn-munching mortals would secretly consider to be like boiled carrots at dinner-time. Good for you but no fun at all. But, in this case, The Hurt Locker simultaneously defies expectation and earns its sky-high hype – if you’ve been living under a rock, Kathryn Bigelow’s “little movie” seemingly came out of nowhere to sweep the Oscars, claiming six little gold men and triumphing over the showier Avatar, a David vs. Goliath story made even more memorable as James Cameron is Bigelow’s ex-husband. It’s an Oscar-winning war film that’s horrific without being gratuitous, important without being pompous, and even fun, without glorifying war. The film opens with journalist Chris Hedges’ quote: “The rush of battle is a potent and often lethal addiction, for war is a drug” – announcing how it means to go on – before leaping straight into the action, in 2004 Iraq, shortly after the US-led invasion. A US Army Explosive Ordnance Disposal (EOD) unit loses their leader to a remote bomb, and the remaining members cautiously welcome his replacement, while counting down the days to their leave. Rather than offer a sweeping overview of war, Bigelow wisely zones in on the EOD trio, allowing them to come across as individuals, all with conflicted perspectives. Through Sergeant First Class William James (Jeremy Renner), Sergeant J. T. Sanborn (Anthony Mackie) and Specialist Owen Eldridge (Brian Geraghty), we are given visceral slices of the Iraq war experience. As the bomb-detonating, death-defying maverick James, Renner is worthy of his Best Actor nomination. I wasn’t certain at first – I’ve always enjoyed Renner’s performances, typically as charismatic anti-heroes, be it the baddie in SWAT or psycho vampire in Angel – but it wasn’t initially evident that he was doing anything particularly special in The Hurt Locker. But his role subtly deepened, revealing complex layers and raising more questions about what exactly makes him tick – a mystery he seems unable to solve. The reckless but tender James embodies Hedge’s opening quote – he is addicted to the adrenaline rush of combat, which makes him a successful bomb technician, but not always a great team leader – or family man. The dynamic between James, Sanborn and Eldridge is the film’s core, and is nicely set up by what happens in the first 10 minutes. Sanborn and Eldridge were close to their first leader, and the loss of him contributes to their lack of trust for James, and their growing weariness with warfare. Mackie and Geraghty hold their own besides the magnetic Renner. As the by-the-book Sanborn, Mackie is elegant, with tension bubbling away under the surface, as he butts head with James and struggles to maintain composure. More visibly fraying at the edges is the baby-faced Eldridge, a more mature version of Geraghty’s soldier in Jarhead. It’s impossible not to sympathize with him as he contemplates the very real possibility of sudden death or when he has to lick blood off bullets in a fraught situation. Starrier names pop up somewhat surprisingly, with Guy Pearce as EOD’s first leader Sergeant Matthew Thompson, Ralph Fiennes as the leader of a private military contract unit and David Morse as Colonel Reed, commander of American soldiers at the UN building in Iraq. All roles are brief, but effective. Dexter’s Christian Camargo, as the Bravo Company’s out-of-touch psychiatrist is memorable. Evangeline Lilly, as James’ wife back home, however, is simply ornamental. Admirably, the film conveys James’ lust for danger without glamorizing war. When the men fight and kill, they don’t show pleasure, only relief. As a detonator, James’ euphoria naturally comes from ensuring non-events – it’s not death he rejoices in, but life. Their war is one tense event after another, splattered with abject horror, adding up to an existence perched on the edge of an abyss. And yet, as mentioned, The Hurt Locker is funny, albeit darkly. After the team comes to blows with an Iraqi, James quips “if he wasn’t an insurgent, he is now”, referring to how the US offensive is a self-fulfilling prophecy. This continuously comic vein keeps the film from sinking into sadness, while sharpening its attitude. Shaky camerawork heightens the realism, with photographic shots of simple things like cats limping and garbage adding to the oppressive atmosphere. The only let-down is the Academy Award-nominated score, which alternates between near-perfection and aggressively forcing emotions, which would have been better earned with subtler sounds and letting the scene speak for itself. 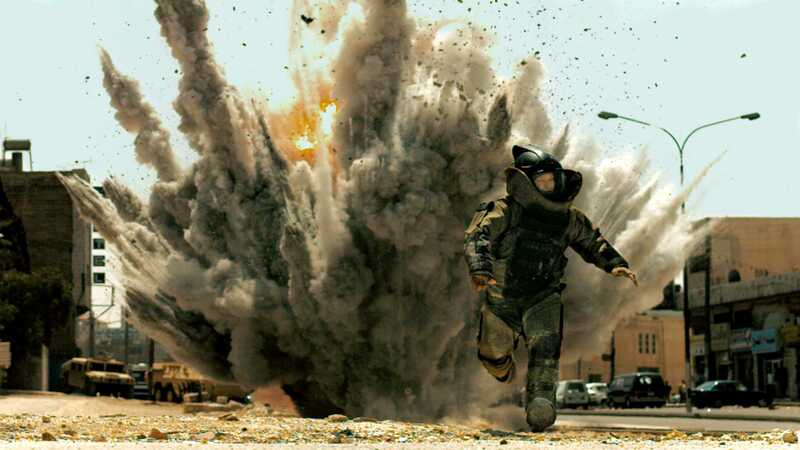 The Hurt Locker is more than a wonderful Hollywood underdog tale. It’s not my personal pick for 2009’s best film, but it definitely deserves to be seen and won’t easily be forgotten. If you haven’t watched it yet, I highly recommend you catch it while it’s still gracing the big screen. Verdict: A gritty and stirring war film that pretty much lives up to the Oscar hype. Hi,season 4 has ended strange because Rita is dead and I’m waiting for season 5.I think season 5 will be the best of the seasons. People in Oz kept telling me to watch it, and then it was playing on the plane on the way back and I STILL didn’t watch it. I shall have to hire it in Nairobi now, i’m glad it lives up to the hype. I don’t usually like war films, but maybe this one will win me over. Yes, I’m not a big fan of war movies either. Still have not seen all of Saving Private Ryan. Give me a fairytale or romcom anyday. But, being forced to watch this, I did manage to see its good points. I wouldn’t force yourself!